The European Geostationary Navigation Overlay Service (EGNOS) is Europe's regional satellite-based augmentation system (SBAS). It is used to improve the performance of global navigation satellite systems (GNSSs), such as GPS and Galileo in the future. EGNOS was deployed to provide safety of life navigation services to aviation, maritime and land-based users. EGNOS uses GNSS measurements taken by accurately located reference stations deployed mainly across Europe and North Africa. All measurements are transferred to a central computing centre where differential corrections and integrity messages are calculated. These calculations are then broadcast over the covered area using geostationary satellites that serve as an augmentation, or overlay, to the original GNSS message. EGNOS augments the GPS L1 (1575.42 MHz) Coarse/ Acquisition (C/A) civilian signal by providing corrections and integrity information for GPS space vehicles (ephemeris, clock errors) and most importantly, information to estimate the ionosphere delays affecting the user . EGNOS messages are broadcast through two geostationary satellites in compliance with applicable standards (MOPS and SARPS). The information provided by EGNOS improves the accuracy and reliability of GNSS positioning information while also providing a crucial integrity message. In addition, EGNOS also transmits an accurate time signal. To get more information about EGNOS GEOs please visit the Signal in Space section. Similar SBAS systems, designed according to the same standard have already been commissioned by the US (Wide Area Augmentation System – WAAS), Japan (MTSAT Satellite based Augmentation System – MSAS) and India (GPS Aided GEO Augmented Navigation – GAGAN in India). ). Analogous systems are under commissioning or deployment in other regions of the world (e.g. System of Differential Correction and Monitoring – SDCM in Russia) or under investigation (e.g. Korea Augmentation Satellite System – KASS in South Korea). Open Service (OS): The main objective of the EGNOS OS is to improve the achievable positioning accuracy by correcting various error sources affecting the GPS signals. The corrections transmitted by EGNOS help mitigate the ranging error sources related to satellite clocks, satellite position and ionospheric effects. EGNOS can also detect distortions affecting the signals transmitted by GPS and prevent users from tracking unhealthy or misleading signals. The EGNOS OS is accessible free-of-charge in Europe to any user equipped with an appropriate GPS/SBAS compatible receiver for which no specific receiver certification is required. The EGNOS OS has been available since 1 October 2009. For more information on the EGNOS OS, click here. Safety of Life (SoL) Service: This service provides the most stringent level of signal-in-space performance to all Safety of Life user communities. The main objective of the EGNOS SoL service is to support civil aviation operations down to Localizer Performance with Vertical Guidance (LPV) minima. To date, a detailed performance characterisation has been conducted only against the requirements expressed by civil aviation. However, the EGNOS SoL service might also be used in a wide range of other application domains (e.g. maritime, rail, road…) in the future. In order to provide the SoL Service, the EGNOS system has been designed so that the EGNOS Signal-In-Space (SIS) is compliant with the ICAO SARPs for SBAS. The EGNOS SoL Service has been available since 2 March 2011. For more information on the EGNOS SoL Service, click here. EGNOS Data Access Service (EDAS): This service is aimed at users who require enhanced performance for commercial and professional use. EDAS is the EGNOS terrestrial data service and offers ground-based access to EGNOS data in real time and also in a historical FTP archive to authorised users (e.g. added-value application providers). EDAS is the single point of access for the data collected and generated by the EGNOS ground infrastructure distributed over Europe and North Africa. Application providers can connect to the EGNOS Data Server and use EGNOS products to offer high-precision services to their customers. The EGNOS EDAS has been available since 26 July 2012. For more information on EDAS, click here. 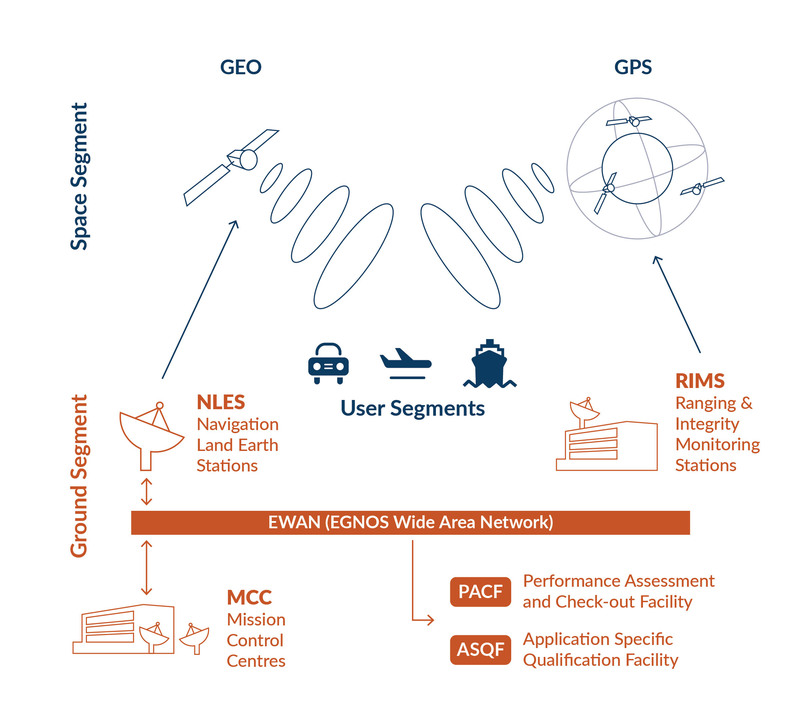 Ground segment: comprises a network of 40 Ranging Integrity Monitoring Stations (RIMS), 2 Mission Control Centres (MCC), 2 Navigation Land Earth Stations (NLES) per GEO, and the EGNOS Wide Area Network (EWAN), which provides the communication network for all the components of the ground segment. 40 RIMS: the main function of the RIMS is to collect measurements from GPS satellites and to transmit these raw data every second to the Central Processing Facilities (CPF) of each MCC. The configuration used for the initial EGNOS OS includes 40 RIMS sites located over a wide geographical area. 2 MCC (control and processing centres): these receive the information from the RIMS and generate correction messages to improve satellite signal accuracy and information messages on the status of the satellites (integrity). The MCC act as the EGNOS system’s 'brain'. 2 NLES per GEO: the NLES transmit the EGNOS message received from the central processing facility to the GEO satellites for broadcasting to users and to ensure synchronisation with the GPS signal. Support segment: In addition to the above-mentioned stations/centres, the system has other ground support installations involved in system operations planning and performance assessment, namely the Performance Assessment and Checkout Facility (PACF) and the Application Specific Qualification Facility (ASQF) which are operated by the EGNOS Service Provider (ESSP). PACF (Performance Assessment and Check-out Facility): provides support to EGNOS management in the form of performance analysis, troubleshooting, and operational procedures as well upgrading specifications and validations and providing maintenance support. ASQF (Application Specific Qualification Facility): provides civil aviation and aeronautical certification authorities with the tools to qualify, validate and certify the different EGNOS applications. Space Segment: composed of at least three geostationary satellites broadcasting corrections and integrity information for GPS satellites in the L1 frequency band (1575.42 MHz). This space segment configuration provides a high level of redundancy over the whole service area in the event of a failure in the geostationary satellite link. EGNOS operations are handled in such a way that, at any point in time, at least two GEOs broadcast an operational signal. User Segment: the EGNOS user segment is comprised of EGNOS receivers that enable their users to accurately compute their positions with integrity. To receive EGNOS signals, the end user must use an EGNOS-compatible receiver. Currently, EGNOS compatible receivers are available for such market segments as agriculture, aviation, maritime, rail, mapping/surveying, road and location based services (LBS). The EGNOS SBAS messages are made available to users every second at a rate of 250 bits per second, hence one Message Type can be expected to be received every second. Even though it is possible to define 64 different message types (6 bits capacity on “Message type identifier” section), only 20 have been currently defined and they can be separated into “Satellite information messages”, “Ionosphere related messages” and other messages. They provide complementary information that needs to be taken into consideration so as to achieve the perfect EGNOS SBAS Messages’ harmony. 2-5 Fast corrections Correct rapid variations in the ephemeris and clock errors of GPS satellites. 6 Integrity information Used either in case of satellite alert conditions or to update fast corrections frequently. 7 Fast correction degradation factor It is used to determine the time-out interval of fast corrections for different flight phases. 9 Geo Navigation message (X,Y,Z, time, etc.) Provides GEO ephemeris and the User Range Accuracy (URA). 17 Geo satellite almanacs Information about satellite health and status along for acquisition purposes. 24 Mixed fast corrections/long term satellite error corrections Broadcast if no. of satellites on fast correction message is less than 6. 28 Clock Ephemeris Covariance Matrix message Not mandatory to be broadcast. It provides the relative covariance. 18 Ionospheric grid points (IGP) mask A nth bit set to 1 indicates that information for the nth IGP is being provided. 26 Ionospheric delay corrections Provides data to compute ionospheric corrections or Grid Ionospheric Vertical Delay. 0 SBAS testing When received, system integrity performances are not assured. 10 Degradation parameters Compute degradation parameters of fast, lon-term and ionospheric corrections. 12 UTC offset parameters Provides time offset related to different time systems. 27 SBAS Service message Not mandatory to be broadcast. Increases accuracy of corrections broadcast on MT 2 to 5, 6 or 24. 62 SBAS internal testing Only broadcast for internal testing. EGNOS is one of the multiple SBAS (Satellite Based Augmentation System) available worldwide. SBAS systems are standardized at ICAO (International Civil Aviation Organization) level to ensure interoperability. EGNOS message types are described in detail in the corresponding SBAS standards, in particular in ICAO SARPS (Standard and Recommended Practices) and in RTCA MOPS (Minimum Operational Performance Standards) on sections A.4.4.9 and A.4.4.10. You can contact the EGNOS Helpdesk for any questions or clarifications. European GNSS Agency (GSA): is in charge of tasks associated with the exploitation phase of EGNOS and overall EGNOS operational programme management. As such, is responsible for decisions regarding system exploitation, evolution and promotion of the services and applications based on agreements with the European Commission (EC). European Satellite Services Provider (ESSP): is the EGNOS Services Provider within Europe, certified according to the Single European Sky (SES) regulation as an Air Navigation Service Provider (ANSP). The GSA has awarded ESSP the EGNOS operations and service provision contract until the end of 2021. European Commission (EC): is the owner of the EGNOS system. The ownership of the assets was transferred from ESA to the European Commission on 1 April 2009 for exploitation. European Space Agency (ESA): led the technical development of the EGNOS system in the past and is now mandated by the European Commission to act as design and procurement agent for system evolutions.